I took Linda Schmidt's online class on Elements in Fabric through Quilt University. What fun it was to experiment with all those strange products. 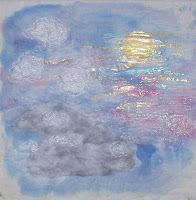 I burned fabric, bleached holes in fabric, melted cellophane and Tyvek, added several kinds of paints and Angelina and foil, all to make the four elements: Water, Air, Fire, and Earth. 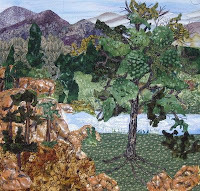 Each is a separate layered, quilted piece which I had framed. The Fire and Water pieces won 1st and 2nd place awards in the April 2008 SMAA Focused Art Show (see previous post). The other two elements, Air (15x15) and Earth (23x24) are complete and pictured above before framing.